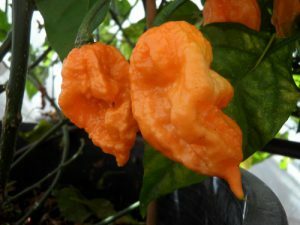 Bhutlah Scorpion-(Capsicum chinense)-This is another deadly hot pepper created by Wisconsin grower Chad Soleski. What is not known is this. 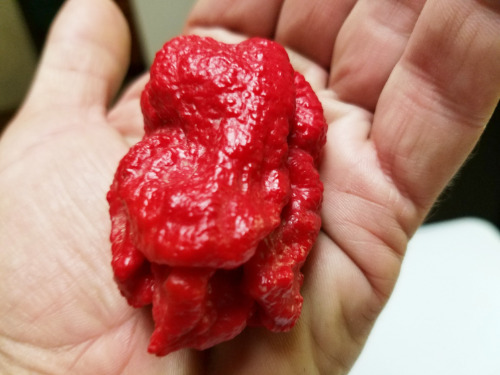 Is this a Red Bhutlah that just started producing monster Scorpion looking peppers within it’s own DNA? 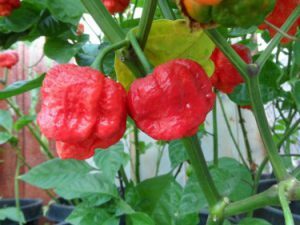 Or did a Scorpion variety from Chad’s pepper patch unknowingly cross into his Red Bhutlah?? We will never know. 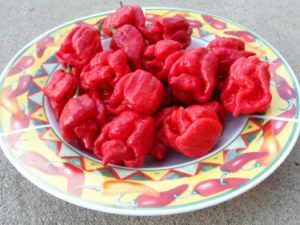 What we do know is Youtube hot pepper eaters across the U.S. say its one of the worlds hottest peppers in 2016! We nickname it and a few others we grow the Reaper Killer! 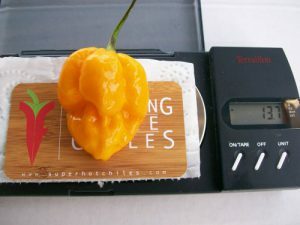 The Bhutlah Scorpion pepper can get larger than most Scorpion varieties. If you can get past the heat it has fruity tones in the background. The Bhutlah Scorpion ripen from green to red. The Bhutlah Scorpion chile plants grow over 3 feet tall.